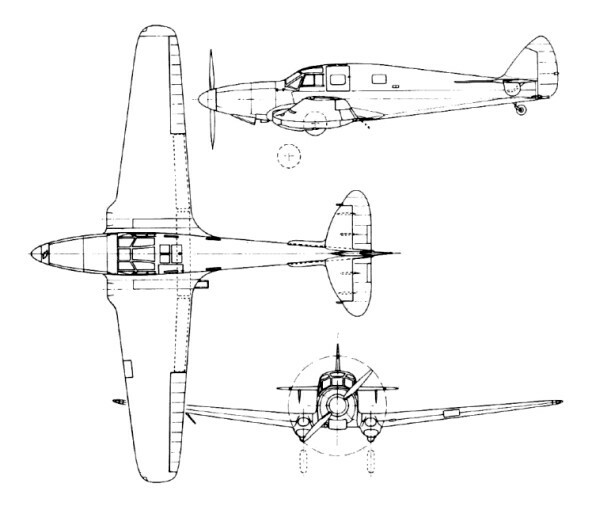 With details outlined in Military Specification T.6/36, the Don was to be a three seat, low wing, general purpose trainer, with the same flying characteristics as the new monoplane fighters and bombers then entering service. In the interests of economy, it was to be a combination trainer, suitable as an advanced pilot trainer as well as radio operator and gunnery training. Arthur E. Hagg designed an aircraft that had four welded steel tube frames bolted together, and attached to a wooden monocoque fuselage which consisted of four resin impregnated moulded plywood sections. The top and bottom sections were curved in heated moulds, while the middle fuselage sections were flat. These sections were strengthened along the joints by wooden stringers which gave the fuselage two distinct lines were the panels overlap. The wings were built in three sections. The front and rear spars were plywood box structures overlain by two thin layers of diagonal spruce planking, the leading edge being plywood covered. The de Havilland Gipsy Twelve engine installed originally in the D.H.91 Albatross was renamed Gipsy King for military use and selected to power Air Ministry Specification T.6/36. Fitted with one inverted V-12-cylinder D.H. Gipsy King 1 air-cooled engine producing 525 BHP at 2,400 rpm, Hagg incorporated the ductd reverse-airflow cooling system he had designed for the Albatross. The air intakes. were built into the leading edges of the wings, the air ducted over the top of the engine inside the cowl, down past the cylinders to exit via the centre of the inverted Vee, and out through the back of the engine. This to intake the Don aerodynamically very clean in order to achieve a high performance from a relatively low-powered engine. Maximum speed was 216 mph (348 km/h) at 8,000 ft (2438 in) arid a service ceiling of 21,500 ft (6401 m) and a range of 855 miles (1376 km), stretching out to 890 miles (1432 km) could be attained when configured as a purely communications aircraft. The Air Ministry dictated that the fuselage had to be big enough for the instructor and air gunner to be able to change seats in flight, arid that two men had to be able to remove and replace the engine in two hours. A variable pitch propeller was to be fitted. The Pupil and instructor were to sit side-by side and have a standard set of instruments for blind flying, while the gunner had to be completely sheltered front the wind, which meant the Don had to be fitted with a turret. The Air Ministry dictated that the fuselage had to be big enough for the instructor and air gunner to be able to change seats in flight, arid that two men had to be able to remove and replace the engine in two hours. A variable pitch propeller was to be fitted. The Pupil and instructor were to sit side-by side and have a standard set of instruments for blind flying, while the gunner had to be completely sheltered front the wind, which meant the Don had to be fitted with a turret. Extra pressure to finish the aircraft came when the RAF ordered 250 Don Trainers but, just as Hagg was making progress, the Air Ministry sent pages of amendments to Hatfield. These were dated 25th July 1936. Without warning, in February 1937, the de Havilland Aircraft Company announced that Hagg had resigned, he eventually being replaced by another of the design team, Ronald E. Bishop. Bishop and his team finished the Don prototype L23871 and it was first flown at Hatfield 18 June 1937. Eight days later Flt/Lr E. R.Symonds flew it at the S.B.A.C. air show. Following manufacturer's initial trials, during which small auxiliary fins were fitted beneath the tailplane, the aircraft was transferred to Martlesham Heath on 14th September for official evaluation but fell short of what the Air Ministry had by then decided they wanted. The prototype was flown by three pilots, who found that "unusual" force was needed to stall the aircraft, for the control column got progressively heavier as the speed slowed and the stick was pulled back. With the flaps up the Don stalled marked with a sharp wing drop. With the flaps down, the wing drop was less marked, but was accompanied by a snatching of the ailerons so that, although control was quickly regained when the nose dropped, for a moment the wing could not be raised with the ailerons. The Don prototype was returned to de Havilland's where the stalling problems were improved with the addition of a four-foot long strip to the wing leading edge. Small fins were fitted near the ends of the tail plane and thereafter the Don stalled without the vicious wing drop. On 19th January 1938 a pilot from Martlesham came over to Hatfield to retest the aircraft and he considered that the handling was now acceptable provided a spring loaded elevator control system was fitted to reduce the load on the control column during take-off. A three bladed propeller was fitted to the second Don to improve the take-off, but to achieve a satisfactory climb rate, the engine supercharger had to be boosted to get the revs up to the required level. More changes were made and the mass balances on the elevator, as well as new undercarriage oleo struts, finally produced a satisfactory landing and take-off roll. The test pilots acknowledged that the handling had improved, but criticised the poor view, difficulty in getting in and out, excessive take-off distance, and heavy elevator controls. Armament consisted of one Lewis gun with three magazines, in an enclosed rotating turret, one fixed Browning gun in the wing and provision for 16 practice bombs tinder wing. llowever the Brownin, machine gun tended to fire erratically and several modifications were made to improve this, but to no avail. The changes needed to satisfy the RAF were still as elusive as ever and then, on 24th June 1938, the Air Ministry told de Havilland's that the Don was no longer required and the order for all 250 machines was cancelled. The Air Ministry had selected the Miles Master for advanced pilot training and the Avro Anson and Airspeed Oxford for twin-engine, navigation, radio and air gunnery training. But when it was pointed out that when they cancelled the Don, the RAF would end up with a large number of Gipsy Twelve (renamed Gipsy King for the Don) engines from the production line with no aircraft to put them in. To settle this dilemma de Havilland's were given an order for 50 three-seat communications aircraft to be converted from the Don Trainer. The first conversion, L2391, went to Martlesham in September 1938 with the turret removed to test its suitability of carrying three people with parachutes. Accessibility for less agile passengers, such as senior officers, was fixed by adding an external step on the fuselage and an internal step with a hand grip. However the pilot's seat was considered uncomfortable because the fixed back was not high enough and the safety harness prevented the pilot from leaning forward to reach the instruments. In addition there was no cockpit heating and the emergency exit in the roof was difficult i to open if the pilot stayed seated. On 22nd September 1938, the first communications Don, L2391, was completing a fuel consumption test at 10,000 ft (3048 m). The pilots came down to 3,000 ft (914 m) but when they opened the throttle nothing happened, they then tried all sorts of combinations of throttle and propeller settings to no avail. They attempted a cross-wind landing with the undercarriage down but stalled and the undercarriage was torn off and the fuselage then broke near the rear spar. Only 30 Dons ever flew and even in the communications role the aircraft had a very short service life, with most converted to instructional airframes. Of this total 20 were delivered as engineless airframes and the remainder converted for communications duties with No. 24 Squadron and a number of station Flights.